Hilly, unpaved trail with several very steep sections. Riding Run and Perkins NPS Map. For those looking for something a little more advanced, the Perkins Trail is a great choice. This 2.75-miler is one of four trails in the park to have earned CVNP’s most difficult rating, and for good reason: it’s tough. This trail makes for a fun and challenging hike, run, or ride: it’s open to horses, but people on foot are welcome too. Perkins Trail starts at Everett Covered Bridge, and while the beginning of the hike may seem a bit mellow, you won’t have to wait long for the challenging part to kick in. And, if some benevolent hiker leaves a pair of walking sticks next to Perkins Trail’s initial post, take a hint and grab them. You’ll need them to steady yourself and to judge the depth of the upcoming mud pits. CVNP is open year-round, 24 hours a day, and does not charge a fee. Visitors may bring dogs as long as they are on a six-foot leash. Take I-77S to Exit 143 for OH-176 toward I-271 N/Richfield. Turn left onto Wheatley Road. Take a slight right to stay on Wheatley Road. The Everett Covered Bridge Trailhead will be on your right. As mentioned above, the trail starts out pretty mellow, but just as you begin to question why the rating is so difficult, it leads you on a grown-up game of Chutes and Ladders up switchbacks, around muddy sections, down steep, pebbly slopes, and across a shallow, stone-filled creek all while trying to identify wild berries, yielding the right of way to toads and miniature frogs, and marveling at Mother Nature’s art. It’s a workout. One of the coolest things you will see along the trail is the result of a 1996 thunderstorm that damaged a slew of trees. So, in addition to a forest full of tall, healthy oaks, beeches, hawthorns, and hickories, that are wonderful for shielding you 100 percent from the summer sun, you’ll encounter a stump peeled like a banana, a couple of moss-covered logs resembling rolls of Astroturf, and a perfectly parallel trio of toppled trees that look like the makings of a lean-to. Another great part about this trail is that if you find this shorter hike isn’t long enough, you can connect to the Riding Run trail and add on another four miles of moderate to difficult hiking. Avid hikers in search of a new challenge will appreciate the cardio workout that Perkins Trail provides. Less experienced hikers will revel in the sense of accomplishment they feel once they’ve completed their trek. The solitude and silence will appeal to creative types and deep thinkers in need of a serene source of inspiration, a place to meditate, or a detox from daily stressors. 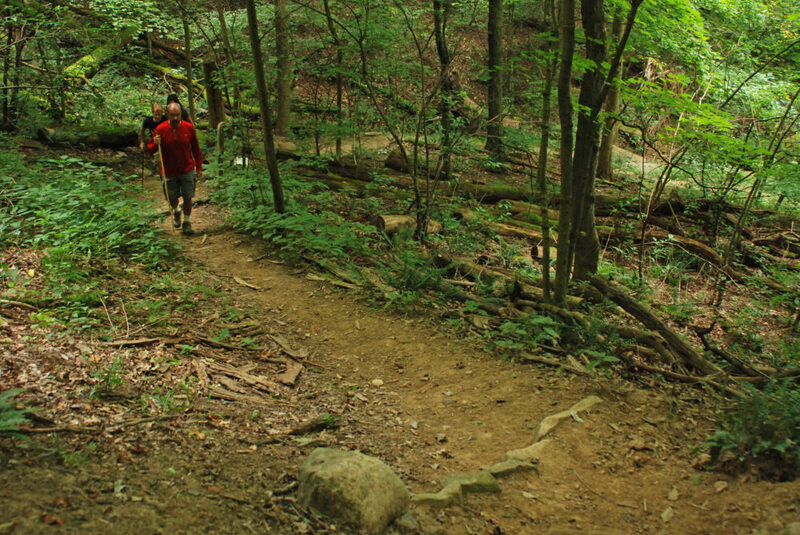 Nature lovers who enjoy hiking but hate dodging branches will find this trail to their liking.